I thought I was ready to move onto the next chapter of this tour through heavy metal history, but as what has been always happening to me, another great rock album from the 70s has sprouted to mind. 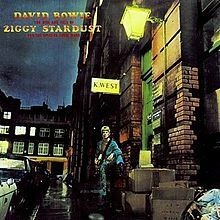 I came upon this one while listening to my MP3 the other day which contains my two favourite Bowie songs of all time; “Space Oddity” and “Ziggy Stardust.” I know that the album “The Rise and Fall of Ziggy Stardust and Spiders from Mars” only contains one of those songs, but I have decided to visit the album anyway. The best reason for visiting the album is quite simple, for an ageing metalhead like me, it takes me back to a time of pure rock. Great tracks like the “Ziggy Stardust,” “Starman” and “Suffragette City” are true rock anthems which helped laid a foundation to the metal we know and love today. For me, this was a time when I thought David Bowie was good before he settled for being popular. Sorry, I just couldn’t get into that “Let’s Dance” stuff in the mid 80s. But Metallica should take note. 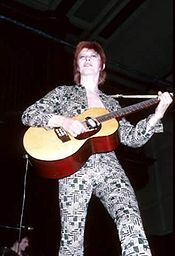 The other thing David Bowie can take credit for is being a key player in the glam rock of the early 1970s. Bowie along with Alice Cooper, The Sweet and later KISS would create an image which would influence a good many metal bands a decade later. If you fancy listening to a classic rock album, then try this one. This entry was posted on November 14, 2011 at 7:31 pm and is filed under Heavy Metal, Music with tags Classic Rock, David Bowie, Heavy Metal, Michael D. LeFevre, Rock And Roll Children, The 1970s, Ziggy Stardust. You can follow any responses to this entry through the RSS 2.0 feed. You can leave a response, or trackback from your own site.